There are a lot of legitimate applications that could be exploited by malevolent third parties for their suspicious purposes. StormWatch might be one of them. This application is designed to display storm alerts in your location. Based on our research, if you download StormWatch from the official website the program seems to function rather well. However, security experts recommend removing StormWatch from computers because this application might as well be used by cybercriminals to promote dangerous third-party content. What is more, there could be other unwanted applications on your computer, so you have to check that too. Some users say they do not know where StormWatch come from and how it got installed on their computers. Although StormWatch does not infect your computer like real computer infections, there is a chance that you really were not aware of the fact that you installed the application. As it has been mentioned in the first paragraph, the direct download link for StormWatch is available at the main homepage via locastormwatch.com. The application itself is another version of Severe Weather Alerts and Desktop Weather Alerts applications, both of which are published by Local Weather LLC. Thus, if you download the program yourself, you should not encounter security-related problems. However, in case of a bundled download and installation, chances are that StormWatch will not display any alerts about the oncoming storms. The application will only work as a device that tracks your web browsing habits and then displays an extensive list of commercial advertisements. Do not be surprised if some of the pop-up ads will be related to your most recent searches – this is how StormWatch tries to push you into clicking the ads. We are not trying to say that StormWatch is a dangerous application, but if it arrived together with freeware, you should be weary of this program. Although StormWatch itself does not try to infect with you malware, the program is highly vulnerable to a third-party exploitation. Usually such applications do not review the third-party content that gets embedded into their ads. Hence, almost anyone can embed their content into StormWatch ads as long as they know how to do it. In case of a malevolent exploitation, you could accidentally click on an ad with an outgoing link to a dangerous website. Some of the websites might be related to pay-per-click marketing schemes while others could be part of malware distribution networks. Despite the fact that malware infection is the worst case scenario that is the most unlikely to happen, you should still uninstall StormWatch and then scan the PC with SpyHunter free scanner. Also, if you have any further questions related to system security, please leave us a comment. Drag mouse cursor to the bottom right of your screen. Click Settings on Charm bar and open Control Panel. Go to Uninstall a program and remove StormWatch. 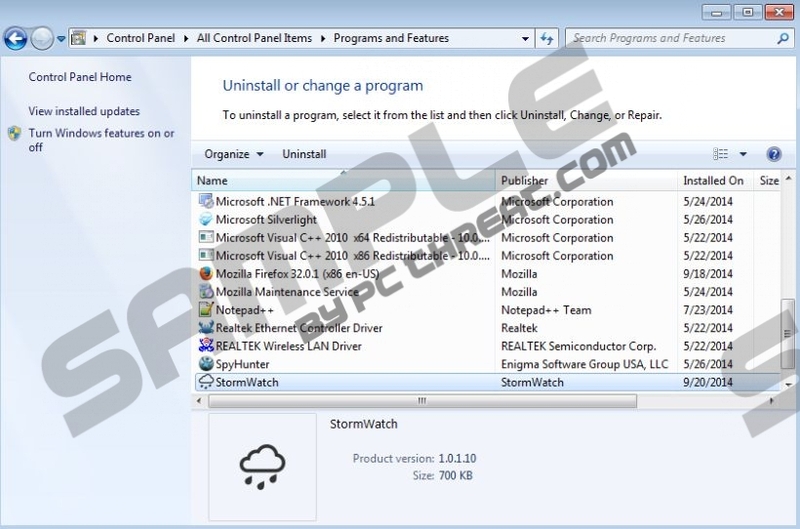 Access Add or remove programs and uninstall StormWatch. Quick & tested solution for StormWatch removal.